The above info came from Jennifer Larson, and was edited by yours truly (contact me). The image came from OnlineAthens.com. Notice: Avatar: The Last Airbender is not Japanese animation! It is a cartoon produced in the US. However, because it has a style that is strongly influenced by anime, I have decided to include it on this site. If you're one of those hard-core anime purists who can't stand seeing a non-anime series on a site dedicated to Japanese animation, then just press the Back button on your web browser and pretend like you were never here. Long ago, the world lived in harmony with the benders of nature: air, water, earth and fire. Each tribe lived together peacefully, until the ruthless firebenders attacked. Every hope of survival was lost except for those under the protection of the Avatar, or the master of all four elements. When the world needed him most, the Avatar vanished. One hundred years passed, and the new Avatar was found by a waterbender known as Katara and her brother Sokka. The only living airbender was found in a glacier in the sea and is 112 years old (though doesn't look it). The airbender, Aang, had great airbending skills, but still had a lot to learn before he could save anyone. 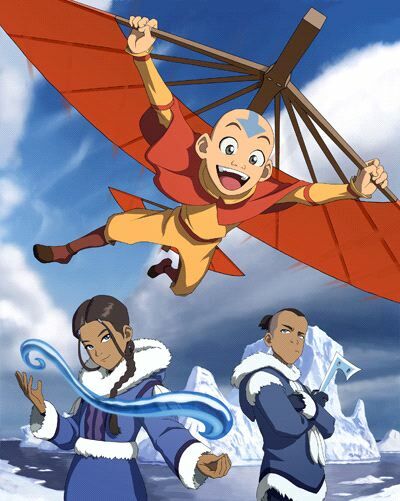 Katara and Sokka join Aang on his quest to save the world, along with Aang's other friends, a lemur by the name of Momo and Aang's flying bison, Appa. The team is on their way to the North Pole, to teach Aang and Katara a little more about waterbending (Sokka's not a bender) and to escape the clutches of Prince Zuko, a firebender who's trying to capture the avatar for his father, the Fire Lord, who doesn't want his own son. Aang's destiny is to listen to his heart and to be guided by the previous avatars before him to learn the bending of the other elements and learn them before an ancient comet arrives to destroy the Earth. The above description came from Echidnaguardian, and was edited by yours truly (contact me). The planet are separated into four nations, Water, Earth, Fire, and Air. In nation there exists humans known as benders. These unique humans can bend any one of the elements according to their own will. However, there also happens to be one, and only one human with the capability of bending all 4 elements... the Avatar. The Avatar is the incarnation of the spirit of the planet in human form, and is solely capable of mastering the 4 elements, making it his/her duty to keep the 4 nations in balance. There is only one Avatar, who reincarnates his/herself through the centuries. Each time the Avatar dies, it is born into the next nation of the cycle. Aang, a 12 year-old airbender who was training to be the next Avatar was caught up in a terrible storm along with his flying bison, Appa. Using his waterbending, Aang encased himself in a giant iceberg, staying frozen and unfound in the bottom of the ocean. Knowing the Avatar dissapeared and was never found, the Fire Nation declared war over the 4 nations. The Air Nomads were all killed, and the Air Temples ravished. The Water Tribes were raided and driven to the brink of extinction. The Earth Kingdom remains to fight a hopeless war against the fire benders. Just when the world needed the Avatar the most, the Fire Nation had attacked. A hundred years later, the Avatar still wasn't found. Some people believe that the Avatar was never reborn into the Air Nomads, and that the cycle was broken. In the South Pole, a water tribe struggles to stay alive. Sokka and Katara, two siblings of the Southern Water Tribe discover a giant iceberg with a boy inside of it. Sokka and Katara rescue the boy named Aang, and discover he is an airbender, a race that has been gone for the duration of the war. Prince Zuko, a young firebender whose mission in life is to capture the Avatar, discovers Aang's true identity as the Avatar! Aang has come to face the terms of how the world has changed when he last saw it. Aang's mission is to save the world by uniting the 4 nations and battling the fire armies. To do that, he must master the 4 elements. Along side him are his friends: Sokka, Katara, his flying bison Appa, and his winged-lemur Momo. In each season is the element Aang must master. Twenty episodes are in each season. He must master the elements in the order: Water, Earth, Fire, and completely master Air. But Prince Zuko is also trying to capture the Avatar, making Aang's journey difficult. He must master the 4 elements and confront Fire Lord Ozai, the ruler of the Fire Nation. Can Aang master the 4 elements and save the world? The above description came from Martin Cordon, and was edited by yours truly (contact me).